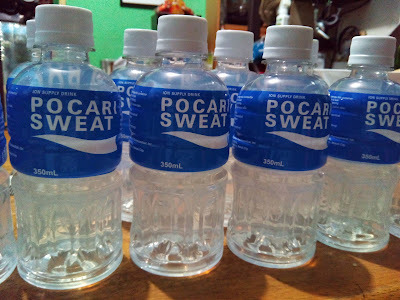 I admit I haven't heard about Pocari Sweat until it was offered to me for review. Living under a rock has its disadvantages- haha. I didn't really know what Pocari Sweat is until the bottles were given to me. The first thing that comes to mind was- Energy Drink. However, I was corrected that it was an Ion Supply Drink. A what? I am familiar with alkaline drink but an ion drink is quite new to me. The day I got the bottles, I was also scheduled to go to the other end of the metropolis. I was all set to brave the horrendous traffic that that area is quite known for but luckily arrived at my destination in an hour and 15 minutes. But still, it was a long ride and it was a hot day. Good thing I have bottles of Pocari Sweat on-hand. I was a bit apprehensive since I prefer to drink it cold but my throat was quite parched and I feel dehydrated already. It was love-at-first-sip though. No kidding. I was expecting a sourish-medicine taste (blame the color) but was surprised that it tasted good. The taste is similar to a mild version of lemonade and soda water; not sweet also. Thumbs up!